The best countertop convection oven is like a small version of an oven – only better. This post will cover everything you need to know about this type of kitchen appliance. By the end of this article, you will know the differences among 3 types of oven – a conventional oven, a microwave oven, and a convection oven. You will also learn about the benefits of a countertop model of the convection oven. 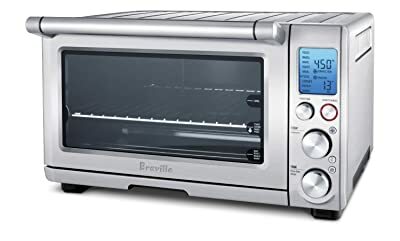 Finally, in the last section, I will provide you with countertop convection oven reviews of some of the best products today. What is a Countertop Convection Oven? Which is the Best Countertop Convection Oven to Go for? 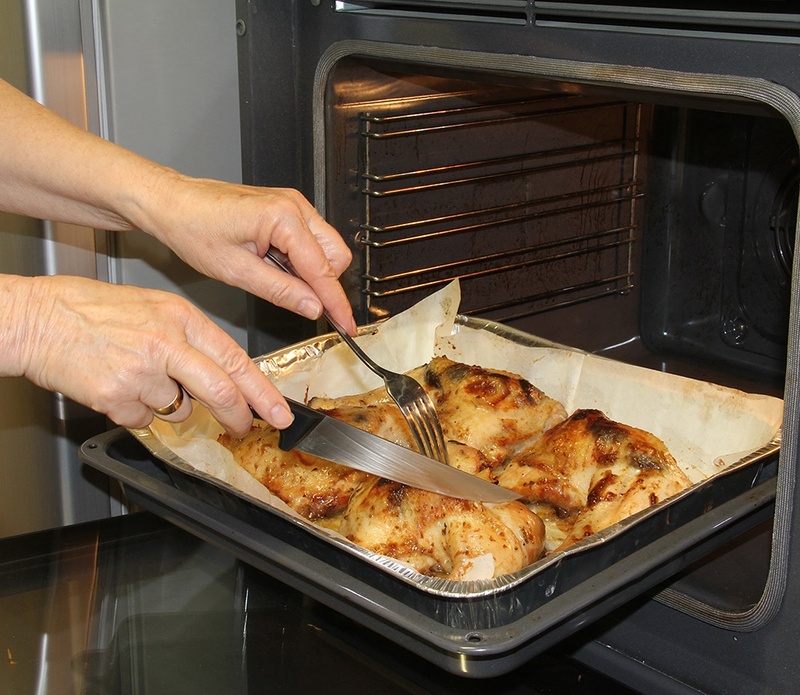 As a type of oven, a convection oven can also bake, roast, broil, etc. The convection feature simply makes this unit more versatile since foods will be cooked faster and more evenly (because of the special design of the oven’s heating element). Since this is a countertop model, it’s definitely smaller than a traditional oven. It’s easier to manage and accommodate because of its size. Knowing about the pros and cons of convection and conventional ovens will help you understand and differentiate the 2 types of ovens easily. This is a large capacity oven that comes with a heating element which warms up the air in the cooking chamber. It can accommodate large portions of food. Air doesn’t circulate well in the cooking chamber of a conventional oven. Parts of food that are closer to the internal heating elements are hotter than parts that are situated far away from the source of heat. There will be hot spots in the food that you’re cooking – this will result in overcooked and undercooked portions in a dish. A convection oven’s heating elements are located at the top, bottom, and back side of the cooking chamber. There is also a fan that works in circulating hot air inside the chamber. There’s consistent temperature inside the oven as hot air will reach every portion of the cooking chamber. There will be no hot spots and cold spots – thus ensuring even cooking of food. As a countertop model, the cooking chamber is not as big and spacious as that of conventional ovens. Another type of oven is the microwave oven – which is also very popular and convenient to use. Below are its pros and cons when compared to other types of ovens. It’s efficient in warming up food. You can use it to steam food. Its baking functionality is very limited. Although some cake and muffin recipes can be cooked in a microwave, some of the ingredients may need to be substituted. And still, the quality will not be as good as cakes and pastries made in a conventional or convection oven. Listed below are some of the advantages of a convection oven over a conventional oven and microwave oven. A convection oven can brown and crisp the surfaces of food when baking or roasting without drying it out (so that flavor is retained). A conventional oven can do this, too, but there could be moisture-loss. A c﻿﻿ountertop convec﻿﻿tion oven preheats faster than a conventional oven because it comes with a small cooking chamber. And don’t forget its built-in fan that allows for an efficient circulation of hot air inside the cooking chamber. Like a microwave oven, a convection oven can reheat food quickly. Different ty﻿﻿pes of ﻿﻿cookware can be used in a convection oven – like oven glassware and baking dishes. Plastic containers can never be used in this type of oven, though, even microwave-safe plastic containers. 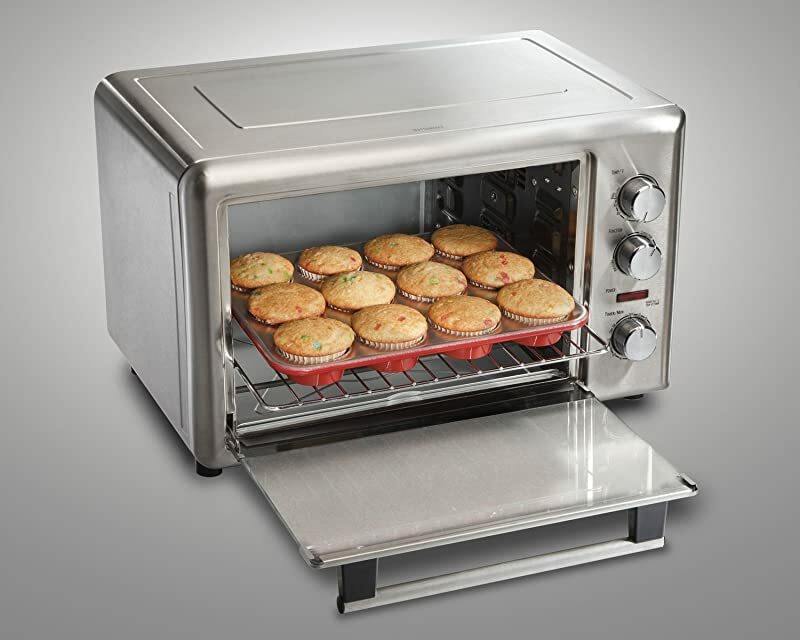 The price range of countertop convection ovens will vary per model. To give you an idea, however, just think of it this way… Microwave ovens are generally the cheapest of the three. Conventional ovens, which are usually built-in, are the most expensive. Countertop Convection Oven is priced somewhere in the middle of the two. It’s a space saver – Since it’s a countertop model, it comes in a compact design. This is a practical kitchen appliance – It’s a small oven that can prepare quick meals. Although it’s not as spacious as conventional ovens, there are units that are high-capacity models. It saves on energy – Keeps in mind that the cooking chamber of a countertop convection oven is small and, therefore, demand less electricity than big types of ovens. 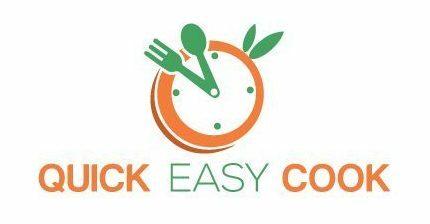 It’s a time-saving kitchen appliance – Cooking time is typically shorter in convection ovens because of the properly heated cooking chamber. To inspire you to cook in your convection oven, I am giving you 3 easy recipes that you can try at home when you buy your countertop convection oven. You can cook a whole chicken in a turbo type of convection oven. You can watch this video for a simple recipe for roasted chicken. You can make your own pizza in a countertop convection oven. This gives you the flexibility to use your own ingredients and favorite toppings. Click here to watch a video on how to make a homemade pizza with a countertop convection oven. Below, I have reviewed 5 models of countertop convection ovens for home use. Note that you will not find any commercial countertop convection oven in this particular post. 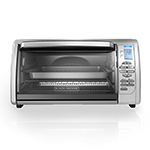 The Hamilton Beach 31103A countertop convection oven landed on the number 1 spot because of its many amazing features. If you want to get it, know that it’s available in the color silver. Revolving Rotisserie – You can roast a 5-pound chicken in the accompanying rotisserie system. Design – This model is designed to accommodate 2 cooking racks at a time. You can, therefore, cook 2 12-inch pizzas at a time. You also have the option of having 2 9x13-inch dishwares or pan for cooking or baking food. Control Dial – It comes with a knob for choosing and adjusting time, temperature and function of the unit. Materials – It’s made of stainless steel. It has the non-stick interior that’s easy to clean. The package comes with a lot of free accessories – 2 cooking racks, 2 baking pans, a broiling rack, and a set of rotisserie. It’s easy to operate – the knobs are particularly easy to use. The unit gets really hot during operation. The temperature setting is a little off. If you set it to 375 degrees Fahrenheit, it will operate at just 350 degrees Fahrenheit. This model of countertop convection oven from Black and Decker is very powerful. Should you decide to get it, it’s only available in 1 color – silver. Power – It’s powered by 1,500 watts. Digital Control – The digital control panel ensures accurate temperature and function controls. The maximum temperature is 400 degrees Fahrenheit. Timer – It comes with the 120-minute timer. The unit will automatically turn off when the timer is set. Preset Functions – The preset functions include Bake, Toast, Broil, Pizza, Cookies, Snacks, Frozen, and more. Materials – It’s made of stainless steel materials. The cooking racks can be used on 2 different levels. You also have the option of using 2 racks at the same time or just 1 rack. The nonstick interior is very easy to clean with damp cloth. 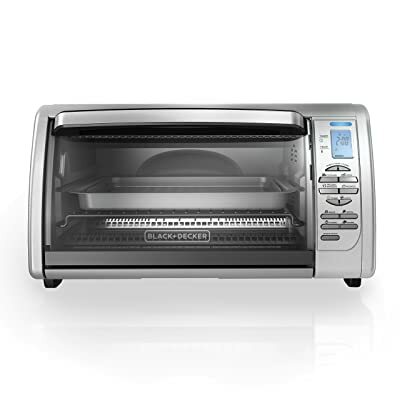 The package includes a baking pan, broiling rack, and toasting rack. The digital screen is quite small. The printed words can get erased with constant use. This is a very affordable countertop convection oven that’s also very useful. It can accommodate 12-inch pizzas and 9x13 pans (without handles) – and you can even use 2 cooking racks or pans per setting. If you don’t mind the cons, consider buying this model. 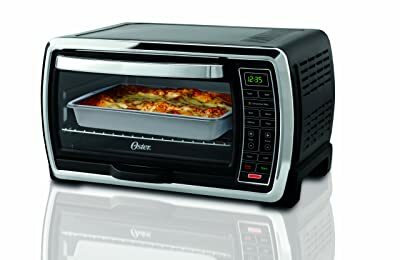 This Oster countertop convection oven is one of the best models you can find on the market today. It comes in the attractive color of black stainless steel. Power – It has 1,300 watts of power. Capacity – It can accommodate a 12-inch pizza, or a 9x13-inch pan (without handle) or a whole chicken, or 6 pieces of toasts. Temperature Range – Its temperature settings can be set anywhere from 150 to 450 degrees Fahrenheit. Control Panel – It comes with a digital control panel. Timer – A 90-minute timer with auto shut off is built into the unit. The cooking rack can be adjusted in 2 different levels. The door is see-through to make it easier to view food inside while cooking. The cord is quite short (about 2 feet). The beeps are quite soft and hard to hear. Since its exterior can get really hot, it needs a large clearance from surrounding walls and objects. As you can see, this is an all-around countertop convection oven that can cook different types of food. At a very reasonable price, you can create your own pizzas, cakes, and meat dishes right in your own kitchen. As the most powerful unit in this Top 5 list, the Breville BOV800XL countertop convection oven is available in 2 colors – cranberry and silver. Power – This unit is powered by 1,800 watts motor with 5 Quartz heating elements. Preset Functions – Some of the pre-programmed settings include Toast, Bake, Broil, Roast, Reheat, Warm, Pizza, and Cookies. Element IQ Technology – This technology ensures proper heat distribution, accurate power control, right temperature and correct timing for cooking food. It also remembers previous settings. Backlight Design – The backlight writing changes from blue to orange during operation. Materials – It uses stainless steel materials. Because of it's internal space, it can accommodate large portions of dishes. It comes with a free baking pan as a bonus. The preset functions make it very easy to use and operate. The nonstick interior coating is not PTFE-free and PFOA-free. These chemicals are harmful to health. Except for the chemical issues, this is a great countertop convection oven. You can cook different types of food in it. And since it has a spacious cooking chamber, it can accommodate a 12-inch pizza or 9x13-inch dish/ baking pan. The Oyama TRO-110C Turbo Convection oven is not like regular turbo broilers. It grabbed the number 5 position on this Top 5 list because it’s worth considering when looking out to buy a countertop convection oven. This model is available in the color white. 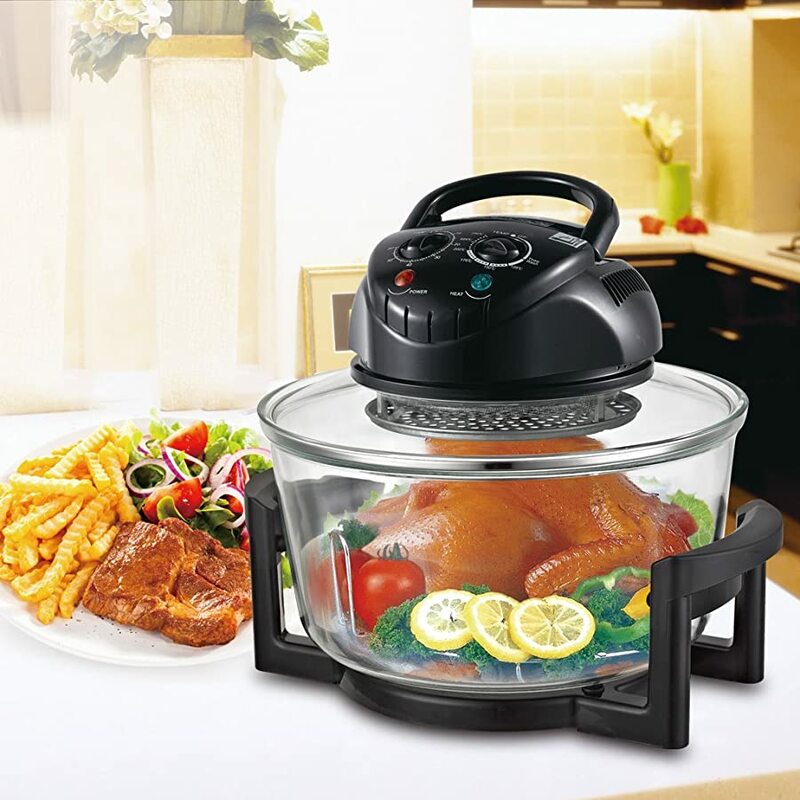 Functions – Some of the included functions in this model are: Bake, Roast, Grill, and Steam. Capacity – It comes with a 12-liter glass bowl. Accessories – The package includes 2 wire cooking racks, a pair of plate tongs, a lid stand, and recipes. Materials – The cooking bowl is made of tempered glass materials. It’s easy to clean – just use mild soap and water. It comes with a short and a tall rack for cooking different types of food. It’s easy to use, just like a standard turbo broiler (only with more functions). In spite of being a convection type of turbo oven, some food can come up dry. Since the heating element is located at the top, some food can have burnt surfaces. 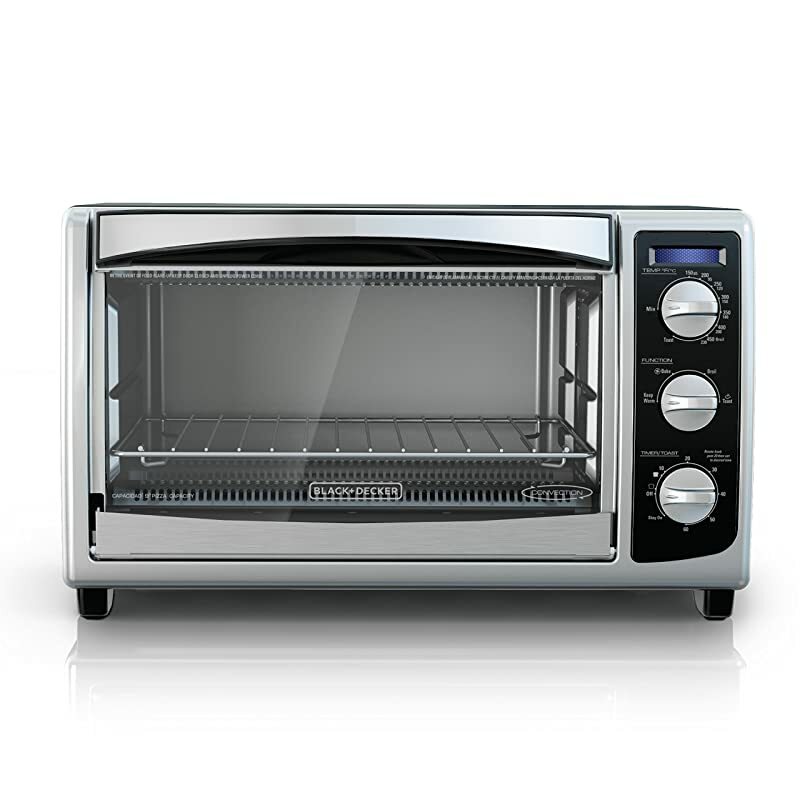 You will like this model of countertop convection oven if you are used to cooking in the turbo broiler. Because of its size (this is not a large countertop convection oven), it is only recommendable for small families. You can’t even cook a 12-inch pizza in this turbo oven (well, you can, if you don’t mind a tight-fitting pizza) – a 9-inch pizza will be more easily accommodated. You have just seen the features, pros and cons of 5 of the best countertop convection ovens today. Have you made your choice on which one to buy? I have listed the products in a Top 5 format to let you know how I feel about each one of the models included in the list. If you noticed, I particularly took note of a unit’s quality and price before giving the overall rating and ranking. To wrap it up, I would have to say that your best choices are the top 3 models (Hamilton Beach, Black and Decker, and Oster) – which basically have the same features and designs. And take note – all three units are reasonably priced as well. 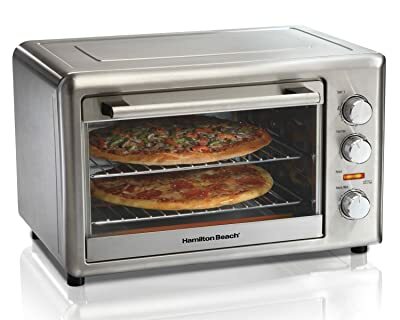 I am particularly impressed with the Hamilton Beach 31103A Countertop Convection Oven because it also comes with a Rotisserie function (a feature that’s not present in the other models). 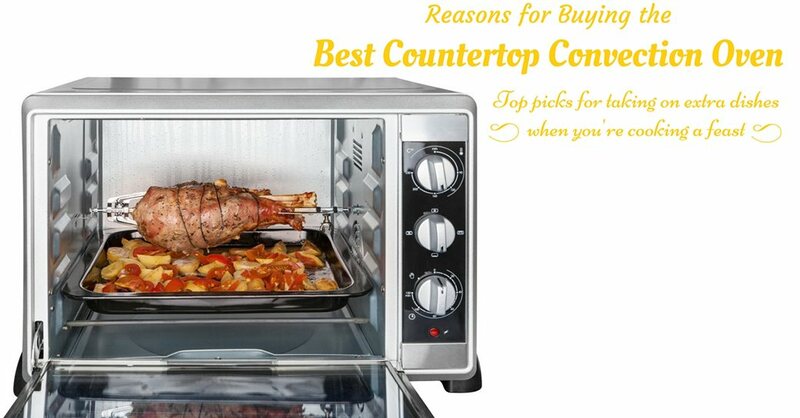 All in all, I think it’s the best countertop convection oven in the Top 5 list – and I highly recommend it to you. While the Breville BOV800XL Smart Oven is powerful and quite remarkable, I am not recommending it too much. First of all, it’s not PFOA and PFTE-free. And then, the next issue is the price – it’s very expensive. 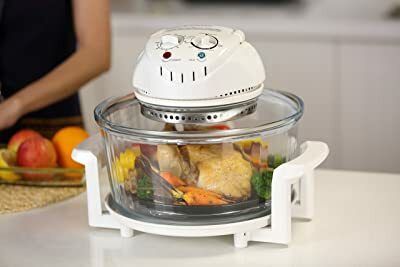 I kind of like the Oyama Turbo Convection oven because it’s inexpensive and simple to operate, especially if you’ve used a Turbo broiler before. But then, it has limited functions and capacity (when compared with the other models in the Top 5 list). So again, let me reiterate that you won’t regret choosing any of the models in the top 3 – the Hamilton Beach 31103A Countertop Convection Oven, the Black and Decker CTO6335S and the Oster TSSTTVMNDG. For sure, one of those units is the best countertop convection oven for you! Let me know which one you picked in the comment section below. And if you know anyone who’s also looking for a countertop convection oven, be an angel and send them this information as well.